This is not a typical C4P post, to be sure, but since I live in Chardon and have a son in Chardon High School where yesterday’s shootings took place, I thought I’d offer my “too close for comfort” view of yesterday’s events. I won’t get into the information available in the media as that has been on TV non-stop since yesterday. The local Fox affiliate, Fox 8 Cleveland, has multiple stories on the disaster and is continually updating them. Rather, I’ll briefly chronicle yesterday morning’s catastrophe from my perspective. I have two kids. My daughter is in 8th grade at the middle school and my 15-year old son is in 10th grade at Chardon High School. They both ride the same bus in the morning since the two schools are on the same plot of land in the village with the football field separating them. The high school is on the east side, the middle school to the west. Anyway, the bus picked them up at 6:45 AM and off they went. My wife, a pharmacist, was off yesterday and I didn’t have to teach until 10:10. With that in mind, we went back to bed as we normally do. Our sleep was interrupted by the phone about 10 minutes after 8:00. Since the phone is on my side of the bed, I sleepily picked it up just before the answering machine would have. This is what I heard. Hearing this was surreal. This is not a message I ever expected to receive. I was very tired and probably thought at first I was having a bad dream. A shooting? In Chardon? My wife stirred and asked me who was on the phone. My head cleared. I can’t remember exactly what I said but it was something to the effect that we have to get up and get down to the school. I then told her the essentials of the voice recording and we both began freaking out, to put it mildly. We quickly put some clothes on and discussed what we should do. The message said not to come to the high school. However, it became obvious as we watched TV and saw all the people at the school that this course of action (or inaction) wasn’t going to work for us. We got in the car and began driving toward the school about 8:35 or so, I think. We turned right off my street onto Woodin Road toward town. A few hundred yards later, we noticed a car stopped on the road and a man standing next to it. We couldn’t see past his car since the road beyond goes into a sharp curve while dropping steeply down into a deep valley. The guy came up to our car and said the police had arrested “the second shooter” just ahead and that the road was declared a crime scene and closed to traffic. Sure enough, we later read that he had indeed been captured on Woodin Road. Now our first reaction was to be overjoyed. The guy had been caught on Woodin and the text received from our son came afterwards, therefore he was safe enough to send the message after the guy was caught. But, at the time, there were still rumors that there was more than one shooter with at least one still in the school menacing students and teachers. Add to that the use of the word “people” in the text above and the man in the road’s phrase “second shooter” and there was still plenty of uncertainty regarding our son’s safety. I called the university, cancelled my 10:10 class, and we continued driving to the school. We parked at a Methodist church about a quarter mile north of the school complex since the entire area was a mass of humanity and traffic. Satellite trucks were rolling into our sleepy little town and I counted three helicopters above. I saw at least one SWAT team, sheriff’s deputies from both Lake and Geauga County, the Ohio State Police, Chardon Police, even DEA agents. The crowd of people was enormous — not unlike it is on the 4th of July when Chardon has their annual fireworks display. Of course the mood was decidedly less festive. Since the phone message we received (listen above) indicated the high school kids would be evacuated to Chardon Middle School, we joined the crowd in front of the middle school which was also in lockdown. Rumors abounded so nobody really knew what was going on. Nervous parents huddled in groups and spoke pensively. Most wore what could only be described as numb looks on their faces. It was clear, however, that the high school kids were not at the middle school. Why, I wondered? Finally, someone who looked authoritative walked through the crowd and said the high school kids were in fact being moved to Maple Elementary, to the east of the high school. Some do*chebag pulled a gun in the cafeteria and started shooting people. My son’s perspective of yesterday’s events was quite different than ours. Like me, he has trouble eating in the morning until he’s been up long enough to generate an appetite. For that reason he eats a small snack at home and doesn’t partake in the high school’s breakfast. If he had, he may well have been in the cafeteria when the aforementioned do*chebag blew a gasket. By the time of the shooting, about 7:30 AM, he was sitting in his first period class, English, on the opposite side of the building. He heard nothing: No gun shots, no screams, no commotion at all. Shortly after 7:30, there was an announcement delivered over the PA system announcing that the school was in lockdown which means all doors are locked, lights are turned off, and the students have to sit on the floor in the back of their classrooms away from the door. 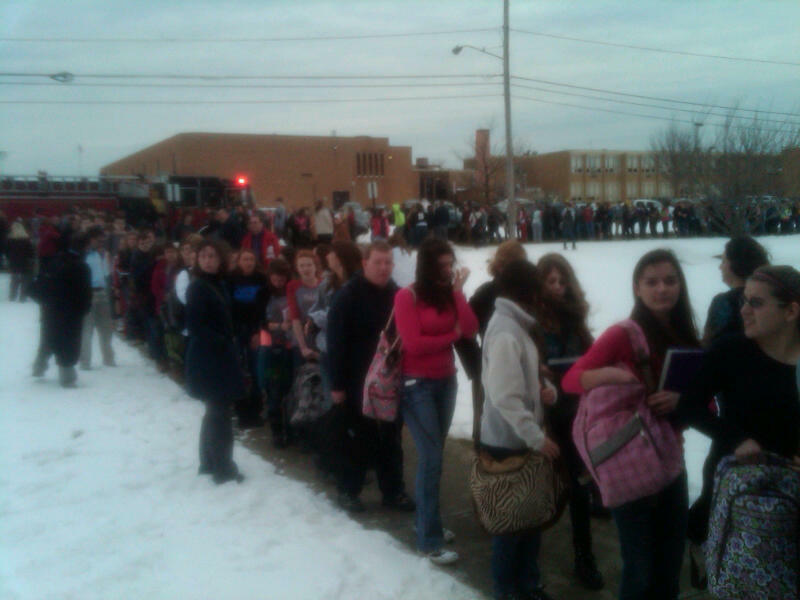 My son and his classmates assumed this was just another drill, something Chardon conducts on a regular basis. Keep in mind that nobody in his class had heard anything so there was no reason to be suspicious. Yet. However, after sitting on the floor for about an hour, far longer than they do during a drill, suspicions began to grow. Those suspicions were confirmed when two cops burst into the room with rather large rifles and yelled something like “is everyone in here OK”? Assured that they were, the cops told everyone to stay quiet and stay put, relocked the door, and moved to the next room. The text message grapevine then swung into full gear and it was shortly after this that my son was able to send us the initial text message quoted above. Normally, the use of cell phones by students in Chardon schools during class is strictly forbidden, but his teacher had the foresight to overlook that particular rule on this day. This undoubtedly resulted in a lot of relieved parents. A tragedy like this really puts politics in perspective and clarifies what’s really important. It’s not that politics isn’t important: It is. But there are things far more important and what happened yesterday in my own town punctuates that fact. One of my son’s classmates is dead and we woke up this morning to the news that another has been declared brain dead. I know it’s a cliché that “something like this could never happen in my town”, but that really is the case here. Or was. Despite what they’re saying on the news, we’re not a suburb of Cleveland. We’re well beyond even the furthest ring of Cleveland’s suburbs and Chardon has always been a safe, peaceful town. The only thing that Chardon ever made the news for until yesterday was lake effect snow and maple syrup. (We’re in the snowbelt and known as the “maple syrup capital of Ohio”.) Not anymore. Update: Via Fox 8 Cleveland, yesterday’s senseless tragedy has claimed it’s third young life. Update II: To get an idea of the utter chaos at Chardon High School Monday morning, listen to the 911 recording below. It’s over 13 minutes long but really give one a sense of the panic and confusion at the school in the immediate aftermath of the shootings. In a word, it’s chilling. Update III: I was just out and drove past the parking lot which is situated between Chardon Middle School and the Chardon Board of Education building where all the press briefings are taking place. I took a few pictures with my cell phone.